One of the most important and valuable tools that Photoshop gives us when editing, retouching or restoring images is the histogram. In fact, histograms are so valuable, they're not limited to just Photoshop. You'll find histograms in lots of other image editing programs as well, like Photoshop Elements, Adobe Lightroom, the Camera Raw plug-in, and more! Many digital cameras today also come with a handy histogram feature that lets you view the exposure of your photos right after you snap them! For something so simple, it's hard to imagine life without histograms, at least for anyone who's serious about the quality of their photos. So what exactly is a histogram? Quite simply, a histogram is a graph. I know, as soon as I mention the word "graph", many people drift off to sleep, but don't worry, this is easy stuff. A histogram is a graph that shows us the current tonal range of our image. By "tonal range", I mean the brightness values of the image. A histogram shows us how much of the image is currently pure black (the darkest an image can be), how much of it is currently pure white (the brightest an image can be), and how much of it falls somewhere between black and white. It's important not to get "black and white" here confused with black and white images. Histograms work equally well with full color photos, since we're dealing with brightness values, not colors (although we can use histograms to view the brightness values of specific colors, but that goes beyond anything we need to know at this point). Why do we need to know the tonal range of our image? Well, for one thing, have you ever looked at a photo that seemed a little "flat"? It may have been a great photo overall but it just wasn't popping out at you as much as it should. Chances are, it's because the image was suffering from low contrast, and you can use a histogram to easily see where the problem lies. It can quickly show us if the highlights in a photo are not as bright as they could be, or the shadows may not be as dark as they could be. Both of these problems lead to poor contrast, but thankfully, histograms make them so easy to spot that we can quickly correct them instead of wasting time wondering what's wrong. Another potential problem that we can run into when editing images is that parts of a photo may be so dark that they've become pure black, or they may be so light, they've become pure white. When this happens, we lose all of the image detail in those parts of the photo. Technically, it's known as "clipping" the shadows and highlights, but you may have heard someone use terms like "plugging up" the shadows or "blowing out" the highlights. It all means the same thing, which is that we've lost image detail. It's not always easy for us to notice either of these problems just by looking at the photo on the screen since our eyes are simply not sensitive enough (although we can distinguish detail in shadows much more easily than we can in highlights), but by taking a quick look at the histogram for the image, we can instantly see if we've gone a little too far with our editing and need to back things off a little bit. Or, if we're restoring an old photo, the histogram could tell us that the original image itself has lost detail in the highlights or shadows, allowing us to proceed from there. The bottom line is, if you're editing images and don't know how to read a histogram, you and your photos are at a serious disadvantage. The histogram is the black "mountain range" in the center of the Levels dialog box. The Levels dialog box contains a black to white gradient bar below the histogram. Why does this gradient make it so easy to understand the histogram? It's because the brightness levels of the gradient match up exactly with the histogram above it! The histogram shows us how the tonal range of our image is currently being distributed between pure black and pure white. The higher the histogram appears over a certain brightness level in the gradient, the more of our image is appearing at that brightness level. The lower the histogram is over a certain brightness level in the gradient, the less of our image is appearing at that brightness level. If the histogram doesn't appear at all over a certain brightness level in the gradient, it means that nothing in our image is currently appearing at that brightness level. The area on the far left of the histogram tells us how much of our image is currently pure black. The area on the far right of the histogram tells us how much of our image is currently pure white. The histogram shows lots of image information spread between black and white. 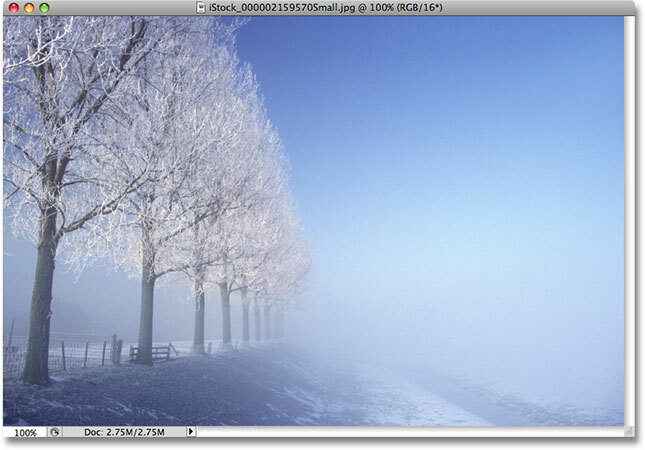 Without even looking at the image itself in the document window, we can see just by viewing its histogram that the photo is well exposed with lots of image detail spread evenly across the range of brightness levels, and since there's very little of the histogram appearing on the far left or right, we know that the shadows and highlights are not being clipped to pure black or white, which means we haven't lost any detail in those areas. 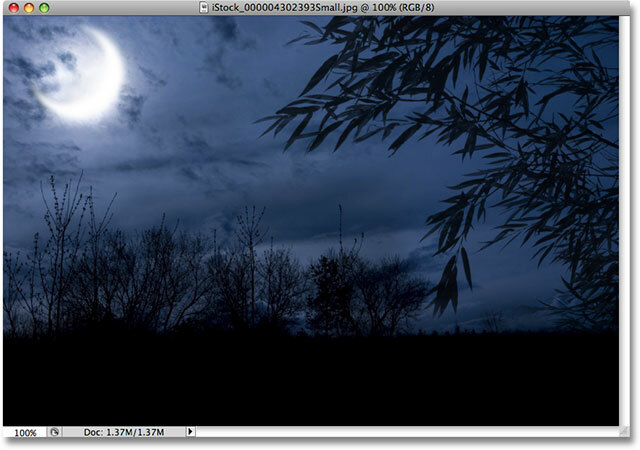 The histogram showing lots of image information on the far left, which usually means shadow detail has been lost. We're not going to worry about fixing the problem here. We're simply looking at the histogram itself, learning how to understand what it's telling us about our images, and learning to recognize potential problems like the clipped shadows in the histogram above. A histogram showing lots of information on the far right usually means that highlight detail in the image has been lost. Without the histogram, you could easily not notice that you've lost image detail in the shadows or highlights until it's too late, but with the histogram, it's like having Photoshop keeping an eye on the image for you as you're working, warning you of potential problems every step of the way. Next, we'll take an even closer look at histograms and answer the question of whether or not there's such a thing as an "ideal" or "perfect" histogram. The histogram displays 256 brightness levels, with 0 being pure black and 255 bring pure white. The "mountain range" appearance of a histogram is actually made up of (up to) 256 individual vertical bars. Keep in mind that there is not a 1:1 ratio between the histogram and the actual number of pixels in the image. Most digital photos these days contain millions of pixels, and if Adobe tried to fit all of them inside the histogram, you would need several computer screens just to view it! Therefore, the histogram simply gives us an overall idea of how much of the image is at a certain brightness level compared to other brightness levels. Also note that even if you're working in 16-bit mode in Photoshop, which increases the number of possible brightness values from 256 to a whopping 65,536 of them, the histogram will still display the same 256 levels of brightness, again for the simple reason that it wouldn't fit on your screen otherwise. Many people ask if there's such a thing as an ideal or perfect histogram. Earlier, I referred to the first histogram we looked at as an example of a "typical" histogram, but in reality, there's no such thing. Every image is different, which means that every histogram will be different. There is no ideal shape for a histogram that you should be working towards. In fact, caring too much about what your histogram looks like would be a big mistake. Histograms should be used as a guide, not a goal. What matters most is the image itself. The histogram simply shows us what we're working with and what sort of problems may already exist in the image (underexposed, overexposed, etc.). And by keeping an eye on the histogram as we work, we can make sure we don't take things too far and lose important image details. However, you should always judge the success of your images based on what the image itself looks like, not what the histogram looks like. An example of a naturally dark image. The histogram shows us that most of the image is made up of darker tones. Notice how most of the histogram falls within the left half of the brightness range, which means that most of the image is dark and there's little in the way of lighter tones. Images like this one are commonly referred to as low-key images because they're just naturally dark. In fact, in this case, there's a large spike in the histogram on the far left, indicating that large areas of this photo are pure black. Now, everything we've learned up to this point tells us that so much pure black is a problem because it means we've lost image detail in the shadows, but as with most things in life, there are occasional exceptions to the rule. In this photo, since the plants in the foreground are meant to be silhouetted against the moonlight, it makes sense to have so much pure black in the image. It would be wrong to try and "fix" this photo just to make the histogram look more appealing. An example of a naturally bright image. This histogram shows us that most of the image is made up of lighter tones. In this case, we can see that most of the histogram falls within the right half of the brightness range, telling us that there are very few darker tones in the photo. In fact, not only is there nothing that's pure black, there's nothing even close to pure black in this photo. Images like this one are commonly referred to as high-key images because they're naturally bright. Here again, it would be wrong to make adjustments to the image simply to balance out the histogram, since the photo itself would suffer. The rest of the tutorials in our Photo Editing section deal with how to actually correct various image problems, but since knowing how to read a histogram in Photoshop is such an essential skill for professional-level image editing, I thought it would be helpful to take a closer look at exactly what they are and what it is that histograms can tell us about our images. Whether you're viewing the histogram on the LCD screen of your digital camera, or using it to adjust the exposure in Camera Raw, fixing overall tonal problems with Levels, boosting image contrast with Curves, or simply keeping an eye on the Histogram palette as you work, hopefully you have a better understanding at this point of just how indispensable histograms really are.